With Super Bowl XLVIII just two weeks away, we are all about to be inundated with ridiculous and hilarious prop bets spanning every aspect of the game day experience. In Part Three of a multi-part series, will the most high profile player in this game, Peyton Manning, call it quits after the Super Bowl? Prop: Will Peyton Manning Play A Down In 2014 Regular Season? 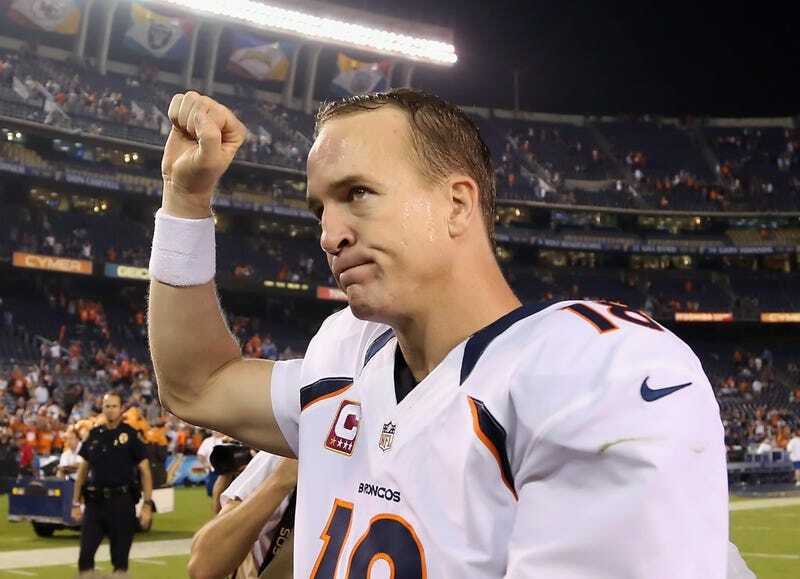 Let's face facts here: Peyton Manning definitely is not going to retire after this game. The dude threw 55 touchdown passes this season and had arguably the best season in the history of the quarterback position. Whether or not he wins this game, he's still got so much left in the tank that he will certainly be back next year. But there are some kooks out there that think he may not. Like this guy! Of course, that guy isn't alone in thinking that thanks to a media who needs things to talk about over the next two weeks and has already planted the seed that Peyton may ride off into the sunset if he gets a second ring on the first Sunday in February. And where the media plants seeds, idiots cultivate money trees for sports books. This isn't to say that it's impossible that Peyton will look back on a potential Super Bowl win and say "you know what? I'm good," but don't worry, Sportsbook.ag has protected themselves in that event as well by making Yes bettors wager $1500 to win $100. While that seems like free money, there is minimal value there, and people would be better served to play props at more valuable odds to them. While this prop seems like it's free money, it's free money at a potentially disastrous price for something that only seems like a sure thing, and could very well be anything but. Either way, this prop will make Sportsbook.ag plenty of cash. Super Bowl XLVIII Propstravaganza! Day Two: Who Will The MVP Thank?